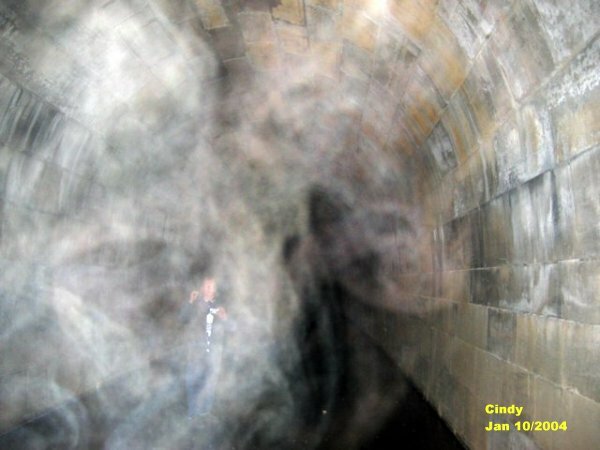 In this photo there appears to be a dog's head that formed, looking right at Cindy. 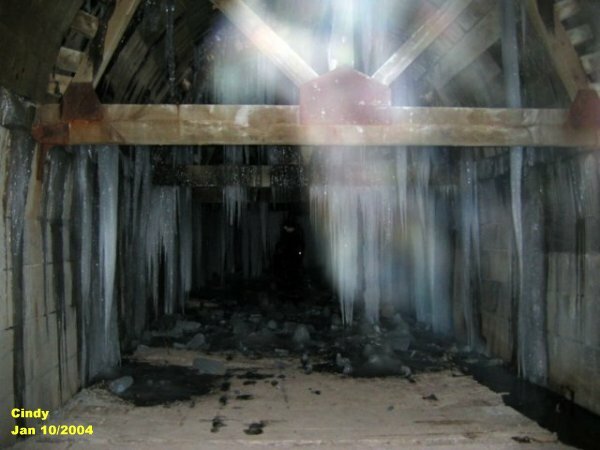 Cindy had made her way through the ice maze to reach the far end of the tunnel and took this picture looking back. 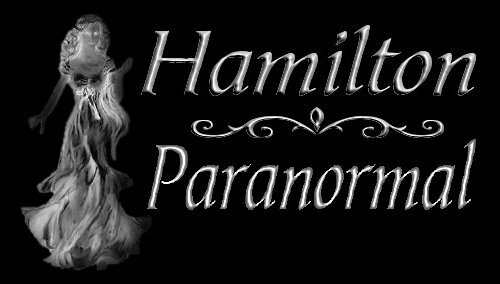 The spirit energy that revealed itself is amazing, with a lot of energy color that showed itself with the ice as a back drop. 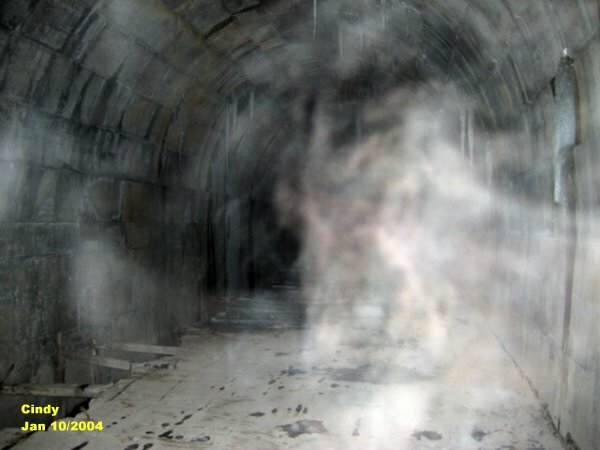 Rick had just walked out to where the water was frozen at the back of the tunnel when Cindy had taken this photo. He was not alone out on the ice. Now this picture shows something that is not of this world. 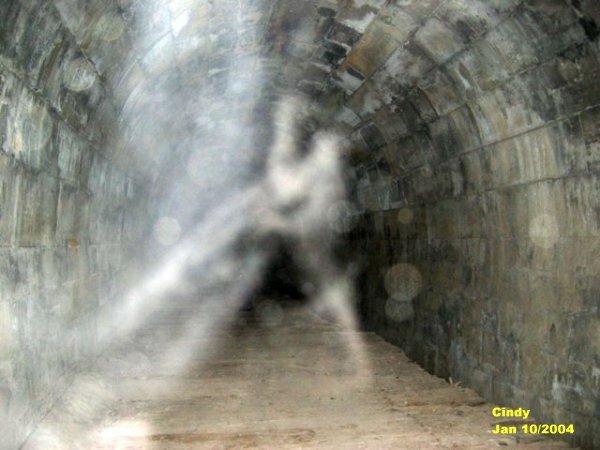 You can see a creature that appeared to be moving within the tunnel that had a long body to it, showing the head of the creature and from the head it shows what would be the vertebrae. It also shows faintly one leg that comes from the vertebrae. My guess would be if this creature were alive this leg would be how the creature moves along. This photo was taken sometime later than the last photo. Again the creature showed itself but further back this time from the camera. You can see the head and the vertebrae and now two tiny legs coming from the verebrae near the head of the creature. Its almost as if this creature seemed to be a part of the reptile family. But again this is nothing like what we know of from this world. 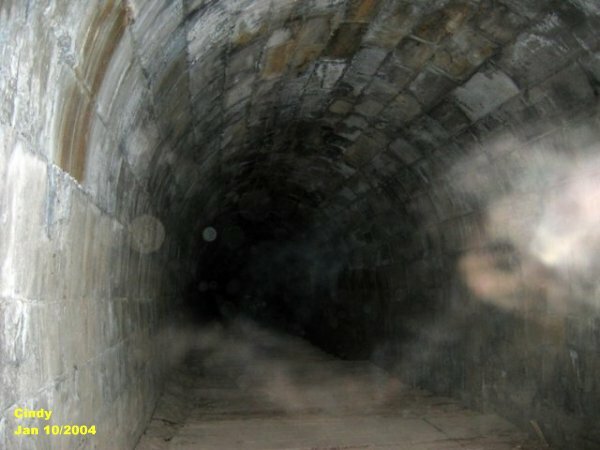 We are still trying to figure out if there could be a gateway from our world to another realm of existance that is linked to the tunnel. 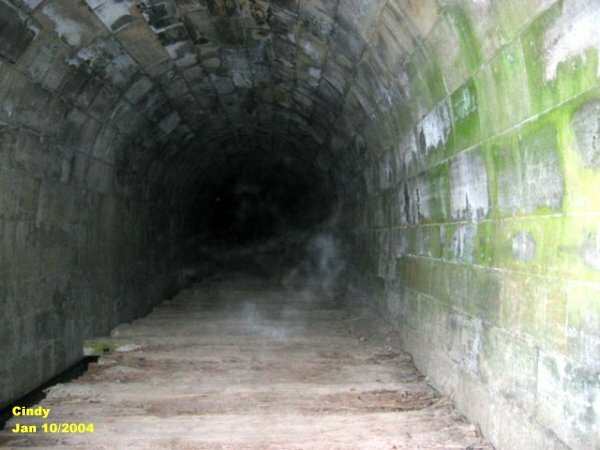 At the beginning of taking photos of the tunnel we never encountered odd looking creatures. But now we discover that we are getting more photos of the unknown and things that cannot be so easily explained. In this photo it looks like a deformed skull. There was a train accident at the west end of the tunnel. Could this be one of the engineers that may have had his head smashed in from the wreck? In this photo it shows a form of a dog with its head looking back. It appears to be that of a doberman in ecto form. 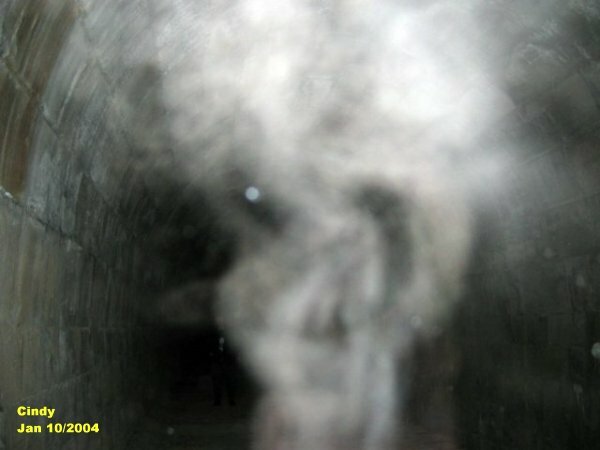 The form can be seen in the ecto mist from the bottom reaching to the center of the picture. Again another weird looking creature starting to form from the tunnel. 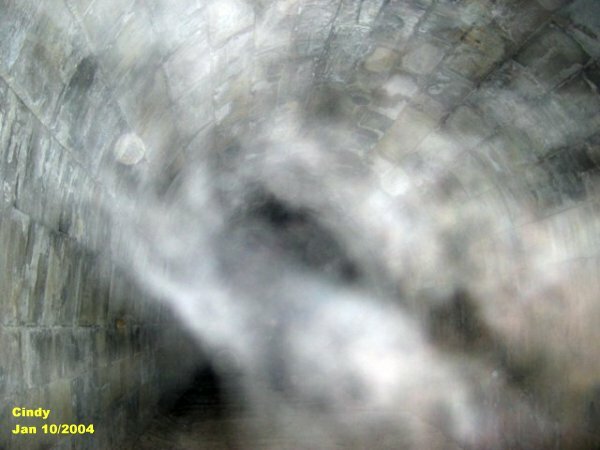 This time the head of the creature is in the center with its legs out in front of it, the body going to the left in ecto form. I have circled the two entities. 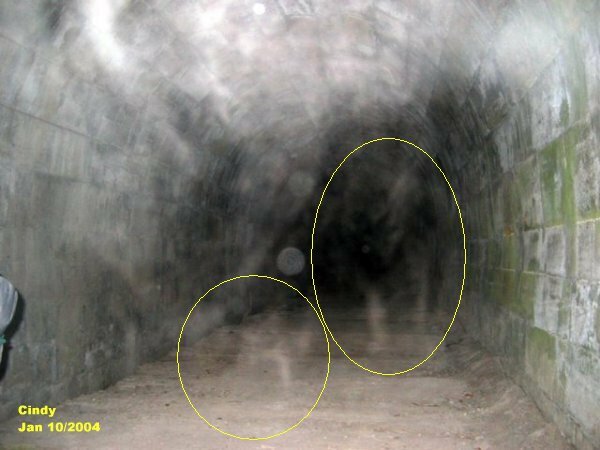 The one that is closest to the ground appears to be a cat, the larger one to the right appears to be a large dog, Both are faint but they are there.